Does the word ‘pushup’ conjure painful memories of school sports lessons? Never managed to get beyond the first five reps? You’re not alone. If you’re struggling with this famous workout favourite, it could be that you’re simply not doing them correctly. Welcome to our complete guide to pushups, that’ll have you reaching your pushup targets in no time. Pushups work your entire body by targeting multiple muscle groups, and building core strength. They primarily work your pectorals, triceps and deltoids. They also strengthen your back, increase hip mobility, boost cardiovascular health and even burn calories. Also, since they’re reliant only on your own body weight, you can do them anywhere, without a need for equipment. On flat ground, place your hands about shoulder-width apart and assume a plank position. You should be on your toes, with your feet roughly shoulder-width apart too. Activate your core and ensure your back isn’t sagging. Then, slowly lower yourself to the floor until your chest touches the ground. Your elbows should be bent at a roughly 90-degree angle. Finally, power up to raise your body to the original plank position. And repeat! The perfect pushup form is a strong, straight line from your head to your ankles. It’s particularly important to keep your spine in a neutral position, so your lower back and hips neither dip nor raise. That means engaging your core, glutes to avoid that back arch. You should be trying to keep your arms tucked into the body as much as possible throughout your push up. You’re aiming for roughly a 30-degree angle from your body here – if they’re flaring out as you dip you’ll be placing strain on your shoulders. It’s also crucial to make sure your elbows and shoulders are stacked directly over the palms of your hands, which are shoulder-width apart. When concentrating on your perfect pushup form, it might be tempting to hold your breath. Your body needs oxygen to power your push up, so be aware of your breathing and align it with your movements. Inhale as you lower, exhale as you lift! When it comes to pushups, quality over quantity is key. Take it slow, and take the time to position your body correctly rather than racing through 30 reps without control over your form. Slow and steady wins the pushup race! Choose a fixed, elevated surface This could be a gym box, a park bench, or a bed frame. The higher the surface, the easier the pushup. Again, ensure your body is in a straight line diagonal to your surface, and get going on your pushups! Not feeling the burn? Seek out a lower surface every few days until you’re ready for the main event. From your plank position, lower your knees to the floor. Keep your feet elevated (not crossed! ), and lower into your pushup as normal. Make sure you maintain a straight line from the top of your head to your knees. Looking for a bigger challenge? Try lowering into a regular push up, then dropping your knees for the push upwards for a 50/50 solution. So there you have it: our essential guide to the pushup! Pushups are a great way of exercising multiple muscle groups using no more than your own bodyweight. However, good form is key to avoiding injury and building strength, which can be hard to achieve on your own. 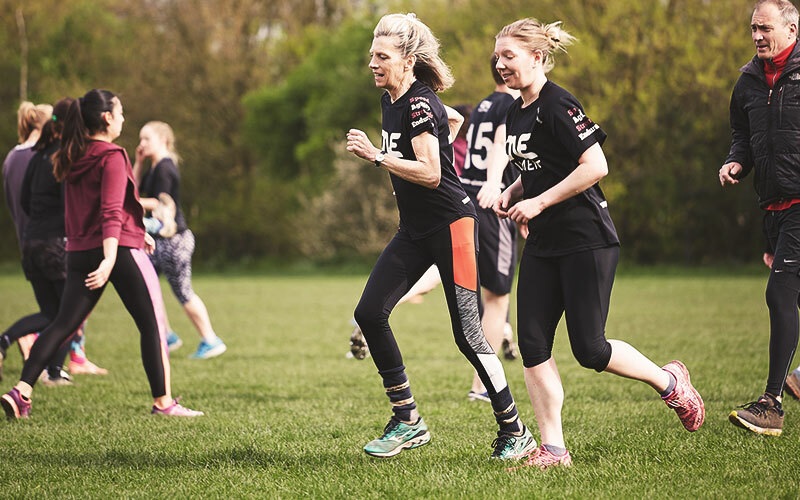 In One Element sessions, our expert trainers guide you through a range of activities to give you energy and quicker results, in a social and fun setting. Interested? Try a free trial today.